. 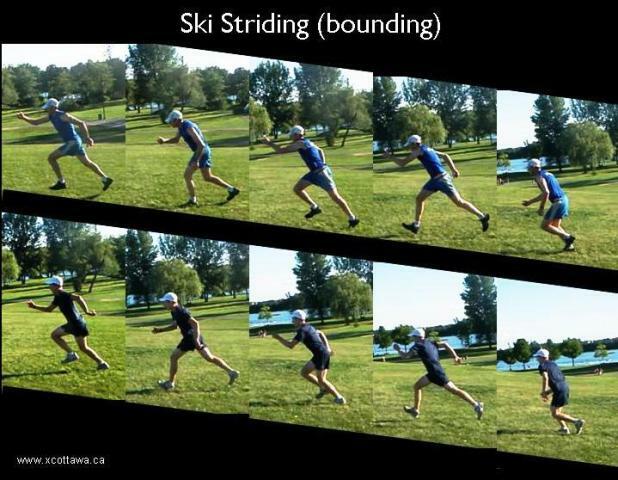 : Great dryland drills to get ready for xc ski season :: Ski XCOttawa.ca :: Skiing in Ottawa and Gatineau Park :. They say “skiers are made in the summer.” Sometimes I wonder if this saying was prompted by coaches trying to help skiers endure those hot summer days while rollerskiing in boots made for subzero temperatures. But I do believe that summer is a great time to set down a solid foundation of ski-specific endurance, strength, and refine technique so that when the snow arrives you c an focus on what you need to get fast for racing. lean into the hill (flex from the ankles with hips forward – don’t bend at the waist). Check this out for pictures and videos of ski walking. We start off bounding without poles. The focus is on stride length, working on exploding off the foot to “hang” in the air. Think of the time in the air as the diagonal stride glide. It shouldn’t feel like running. Hop uphill on one leg, keeping contact with the ground to a minimum. Alternate right and left legs (about 10 hops per leg). Legs together, hop continuously up a hill, keeping contact with the ground to a minimum. This explosive plyometric drill works a lot of muscle groups. Think double poling, get your hips forward and swing arms high to launch you up the hill. Count the number of jumps to get to a certain point, and try to cut down on that number. Here Gavin and Karl show us how it's done. Jump sideways up the hill, using 1-skate timing with the arms. Check out this video (bonus style & rhythm points if you can do in in sync like the APU skiers!). Dragging a tire uphill while ski walking or bounding helps develop strength and power in your legs, hips, and core that is specific to classic uphill technique. The tire also helps you get your body in a good “forward lean” position (hips forward), which is important for good cross country ski technique. Want to try it? Here are more details. 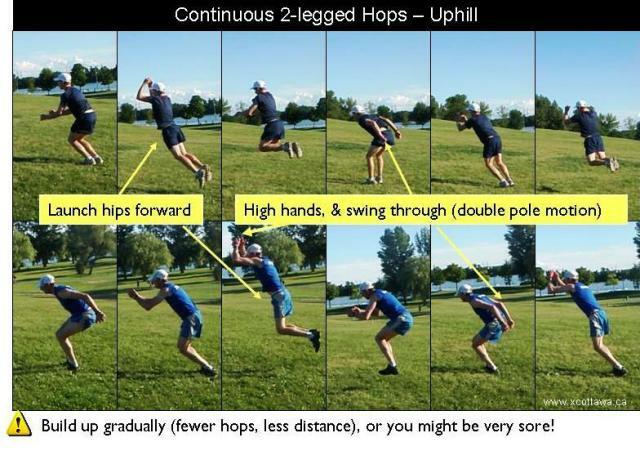 These drills are preceded by a 20-minute warmup run, and typically followed by an interval workout (usually some form of hill interval ski striding with poles for about 20-30 minutes). The benefits of these exercises go beyond skiing, and can help improve strength and agility for other sports. So, even if you typically wait for the snow before you train for skiing, consider incorporating some of these drills into your warmup routine for some summer workouts.